I don’t cry often. When life is challenging I generally default to anger. On the fight-or-flight spectrum, I certainly lean far to the “fight” side. When my life feels out of control, and nothing seems to be going my way, I fight for control and I usually wind up feeling exhausted, defeated, and angry. Friends, can I be bare and candid with you? That’s what I have been recently. Angry. There have been so many life changes in the last year that my head is spinning. Lack of sleep compiled with even more changes in the last six weeks have thrown me into a desperate attempt to somehow regain control. In my futile efforts, I have been angry…a lot. And in my anger I’ve been short-tempered, rude, and sometimes downright mean to the people that matter most to me. I’ve been asking God to make me feel better; to take away my angry feelings. I’ve been asking God to show up and remind me that He’s with me, and to show me some glimmer of hope that He hasn’t forgotten my plight; that He sees, and hears, and cares, and is working. But secretly I’ve been blaming God for my feelings. I’ve bought into the lie that He is the cosmic-kill joy and has left me alone in my anger without care or compassion. I’ve been begging God to fix the circumstances in my life that I’m so frustrated by. It turns out that God doesn’t want to fix my circumstances as much as He wants to fix my heart, and that I have a responsibility to choose how I react when I don’t like what’s going on. God is a gentleman. And like a parent observing their child throwing a temper tantrum, God has been with me, allowing me to throw my tantrum. All the while, He’s been waiting for me to let go of the anger. He didn’t make me feel this way. I’m a sinner. I’m capable of terrible things, and hurting people, and hurting myself, and running away from the God I love dearly. Reality check. A harsh one. A needed one. God’s discipline and correction always comes from a heart of love. He hasn’t enjoyed me feeling burdened and angry. He hasn’t relished me squirming through life’s challenges and stresses. But I have to be willing to take ownership of how I deal with circumstances I don’t particularly like. Do I run to Him first and choose to trust in His good name, character, and proven faithfulness? Or do I fight for control and wind up angry, exhausted, and deafened to the voice of love of my heavenly father? Today I choose to take off the old, dirty rags of anger, bitterness, resentment, and frustration, and I fix my eyes upon Jesus. Today I choose to put on thankfulness for all that I have to celebrate in my life; thankfulness that wages war on my frustrations. I put on joy in the unchanging character of my God. I put on peace as I trust in His goodness and good will towards me. If we are sons and daughters of the Living God, believing in the reality of the life, death, and resurrection of His son, Jesus, then we are no longer slaves to our former selves. We do not have to be bound by anger, by fear, by the need to control in the midst of stress and frustrations. We can live free, run hard, and love strong, trusting in the great love of our God that carries us through it all. I hope that you will start your week of right and join me in letting go of the old and putting on the new. I’m adjusting to having a second child. He’s only six weeks old, so I’m still in the newborn fog part of everything. Some nights are ok, but others are rough. Last night was one of those. I was exhausted, and frustrated, and completely freaked out that I am back to work. There are lots of chores that need to be done around the house, I have a five year old that needs my attention, and there’s exactly one of me. In the darkness, in the depths of heavy exhaustion, I couldn’t help but know that while my plate is full at the moment, it is right where I am supposed to be. And it’s not up to me to “succeed” (whatever that means or looks like). It’s up to me to be faithful. To show up. To give it my best and my all, and to trust God to do what He will with my little self. 1. When I can’t, Christ can. When my to-do list is overwhelming, and when I don’t have the strength or time to do it all, much less do it well, Christ can. Our God is the God that multiplied fish and loaves for the masses. He provided one of his disciples’ tax money by having him find a coin in a fish’s mouth. He made the sun stand still to bring His people to victory. Our God provides for all of our needs, including the time and energy to accomplish what He has called us to do. Surely the God that multiplied one small boy’s lunch to feed a multitude can take my little life and use it. Our job is to hold our to-do list up to Him and ask, “What of this is from you for me to accomplish?” and then walk in obedience trusting Him to make our ordinary extraordinary. 2. If love is not my primary motivation behind each task on my to-do list, what is it worth, and why should I bother doing it? That’s powerfully beautiful, isn’t it? I don’t want to be an obnoxious cymbal standing alone making a bunch of additional noise; I want to be a part of a grand symphony playing rhythmically and strategically. I fear that more often than not I get more of a high from the little checks next to each item than I do loving the God and the people I should be doing each thing for. So, when we’re tempted to feel overwhelmed by the many hats we all wear, when we feel afraid of our inability to do it all, when we actually CAN’T do it all, when we’re multi tasking writing a blog with a baby sleeping on our chest (ah-hem), we can trust that God is with us. Let’s start by evaluating our motives for each item, asking if love is the “why” behind the item, and then let’s walk in brave obedience, trusting God to sustain and accomplish what only He can. For those of you wondering where I’ve been, I’m thrilled to share that my husband and I welcomed our second son, Chase Remington, on June 24. As you can imagine, our lives have been consumed with feedings, diaper changes, and nights filled with frequently interrupted sleep. Here’s to new life, and moving forward with our journey together! Having a second child has been very different for me than having the first. It’s one thing to be told before you have children that being a mother means putting your child’s needs before your own. It’s another thing to experientially know it; to feel the tension of dying to yourself for the sake of your child is very different from hearing it from others. Going into having baby #2, I at least knew to expect discomfort and the pain of sacrificing my immediate wants for my children’s needs (my morning cup of coffee is often delayed until 10am, for instance). But the five years between the births of my children has also taught me that infancy, the toddler years, and preschool pass by faster than I wish they did. They are exhausting years, but they are precious and so beautiful. For my oldest those infantile years are passed and he is now a “big boy” starting elementary school. I celebrate that with him, but it has also created such an acute awareness of just how short a time I have my boys at home with me. Rob Thomas once sang, “Our lives are made in these small hours; these little moments…”. This second, and this one, and this one… make up the minutes that make up the hours that make up the days, and before we know it we’re at the end of our life. These days of no makeup, yoga pants, and spit up in my hair count. That job you’re in that you wish you were done with…it counts. Those times when we spend too much time looking at our phones or tablets (let’s admit it: most of us have to be aware of this…), that time counts too. 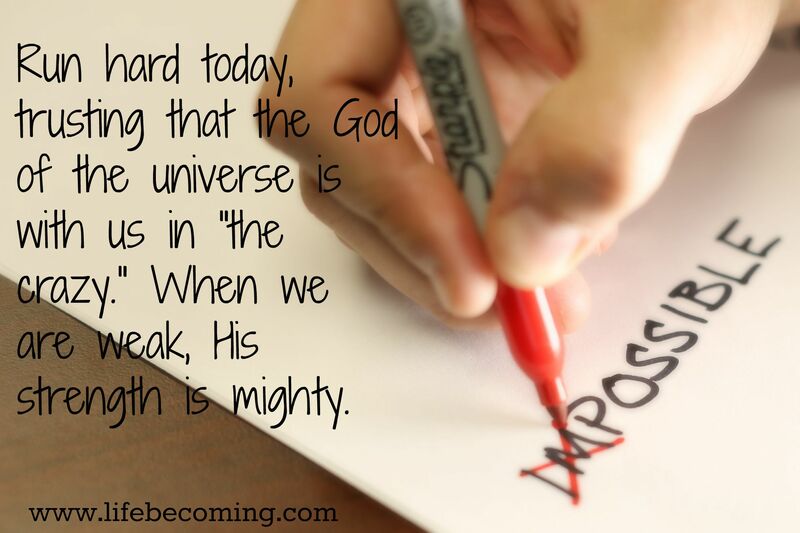 And while God gives incredible, amazing grace, there are no do-overs. When all is said and done, what will we have to show for the time we have been given? God desires for us to invest our time well. So in a world with so many choices, how do we choose well? I am becoming more and more aware of my great need to simply stop and ask God for the wisdom, and then for the courage and strength to obey. At any given moment, there is a full list of to-dos to complete. You too, huh? What would life look like if we stopped and surrendered our days to the good hands of God, and simply told Him, “Yes, Lord. Whatever you have for me today, my answer is yes”? I’ve been trying to practice this more and more, and I’m finding out that sometimes my to-list has to go out the window because my little boy needs his mom to play catch in the back yard. Sometimes I have to buckle-down and get the writing done. Sometimes I have to scrub a toilet, or sweep the floors with a baby strapped to me. And sometimes I need to just sit still and consider the goodness of God in the middle of it all. Daily–even moment-by-moment–let’s stop and ask God what is best. 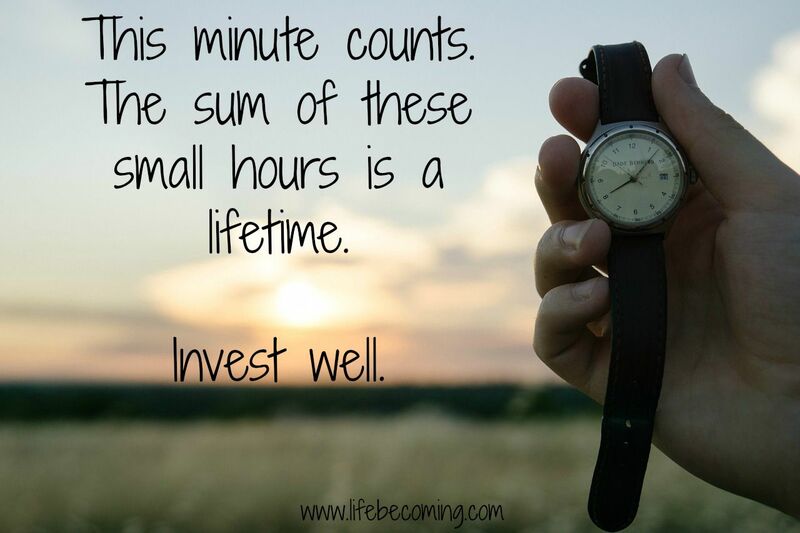 At any given time we all have choices for how we invest our time. It might hurt–when the thing we want to do in the moment is not the best choice. Sometimes we must work when we want to rest. Other times we must choose to rest when the to-do list is overwhelming. Both have their place. But God loves us like a Father, and He has given us His Holy Spirit as a great counselor. So take advantage of it! Let’s ask Him, “Lord, what would you have me choose to do with the time you’ve given me today? How about this moment right now?” And then let’s walk in obedience and let the Lord handle the rest. At the end of our lives, we will not regret choosing obedience to the wise counsel of God. The sum of these small hours is a lifetime. Invest well.